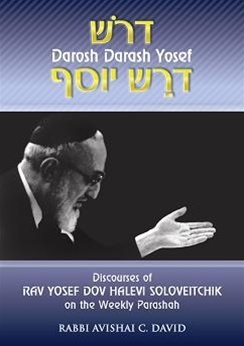 Rav Yosef Dov Halevi Soloveitchik zt"l (1903-1993) was not only one of the outstanding talmudists of the twentieth century, but also one of its most creative and seminal Jewish thinkers. Drawing from a vast reservoir of Jewish and general knowledge, "the Rav," as he is widely known, brought Jewish thought and law to bear on the interpretation and assessment of the modern experience. Rabbi Avishai David, rosh yeshiva of Yeshivat Torat Shraga in Jerusalem, attended the Rav’s daily shiurim in yeshiva for several years during the early and mid-1970s, and was a staunch attendee of the shiurim in Congregation Moriah in Manhattan for over a decade. For five years, between 1977 and 1982, he attended the Rav’s Humash shiurim on motza’ei Shabbat in Boston, as well as many of the summer shiurim that the Rav presented on various topics. The Humash shiurim published in this book are an amalgam of all of the aforementioned venues, but are drawn primarily from the shiurim in Boston on motza’ei Shabbat.